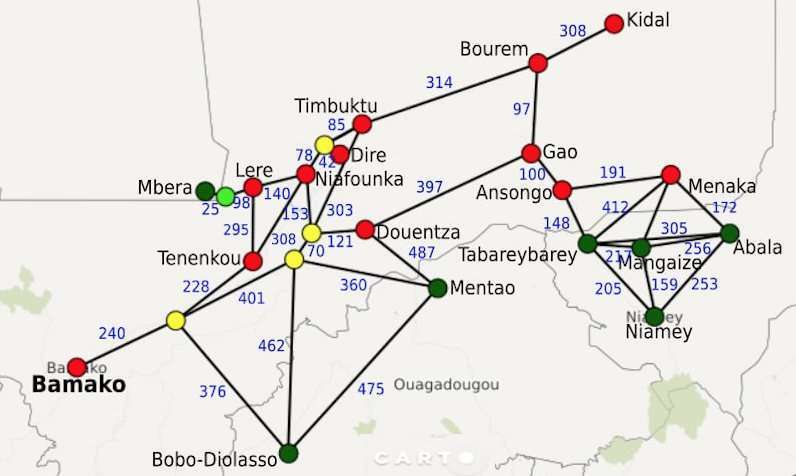 A computer simulation of refugees' journeys as they flee major conflicts can correctly predict more than 75% of their destinations, and may become a vital tool for governments and NGOs to help better allocate humanitarian resources. The data-driven simulation tool consistently managed to predict at least 75% of refugee destinations correctly after the first 12 days for three different recent African conflicts. It also out-performed alternative existing forecasting techniques ('naïve predictions') to predict where, when and how many refugees are likely to arrive, and which camps are likely to become full. They reported their results in Scientific Reports. For example, in Burundi, the simulation correctly predicted the largest inflows in Nyarugusu, Mahama and Nakivale during the conflict's early stages, while in CAR the simulation correctly reproduced the growth pattern in East camp of Cameroon, as well as the stagnation of refugee influx into Chad's camps. In the case of Mali, the predictions accurately captured trends in the data for both Mbera and Abala, which together account for around three-quarters of the refugee population. The researchers' approach uses a new agent-based modelling program, named Flee, which has been released to the public alongside their paper. Agent-based modelling has been used more widely to study population movements, and has become a prominent method to explain migration patterns. However, this is the first time that it has been used to predict the destinations of refugees fleeing conflicts in Africa. Writing in Scientific Reports, Suleimenova, Bell and Groen explain that their simulation is not directly tailored to these conflicts, but a 'generalised simulation development approach' which can predict the distribution of refugee arrivals across camps, given a particular conflict scenario and a total number of expected refugees. The authors state: "Accurate predictions can help save refugees' lives, as they help governments and NGOs to correctly allocate humanitarian resources to refugee camps, before the (often malnourished or injured) refugees themselves have arrived. To our knowledge, we are the first to attempt such predictions across multiple major conflicts using a single simulation approach." While advances continue to be made in data collection during conflicts over the past few years, the researchers urge greater investment: "Empirical data collection during these conflicts is very challenging, in part due to the nature of the environment and in part due to the severe and structural funding shortages of UNHCR emergency response missions. Both CAR and Burundi are among the most underfunded UNHCR refugee response operations, with funding shortages of respectively 76 and 62%". With record levels of 22.5 million refugees worldwide, "more funding for these operations is bound to save human lives, and will have the side benefit of providing more empirical data – enabling the validation of more detailed prediction models." 'A generalized simulation development approach for predicting refugee movements' by Diana Suleimenova, David Bell and Derek Groen (Department of Computer Science, Brunel University London) is published in Scientific Reports. Refugees should be walled up in the third world because third world static culture is incompatible with the first world. The trickle down of first world economic and technological advancement to the third world makes the third world seem more successful than it actually is. The first world provides a model of how to be successful that the third world ignores. If there were only Africa and Native American populations they would not have electricity. Third world culture lives for the present moment, is deficient in abstract thought and only breeds problems for the future. Foreign aid should replace third world cultural pollution and that should be conditional on following the first world model, western civilization. It's nice to see ways to help manage the fallout of global unrest. I believe that surprisingly soon, we will live in a world where war is no longer an inevitability. Already conflict and war today is at its lowest rate in recorded history, and it's stayed that low for fifty years. We slew the horseman of plague with sewers, and we slew famine with refrigerators. Here's hoping we can slay war with the internet. The stone-age doesn't mix with the electronic age. Keep the borders locked up.